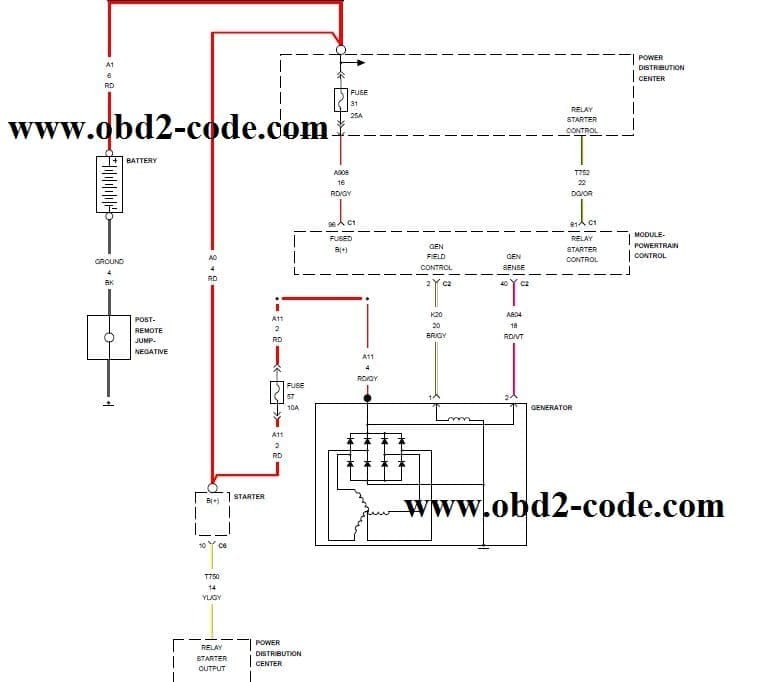 P2503 code - The Alternator output is sensed to be less than target charging voltage, during engine operation, for a calibrated period of time. Set condition this DTC with the engine running, the engine speed is high enough (normally above 1157 rpm) to insure suffient alternator current output to satisfy the electrical loads. Inspect and test the battery with the midtronics battery tester or equivalent for a shorted or dead cell before continuing with this test. Inspect the vehicle for aftermarket accessories that may exceed the alternator system output. If the P0622 DTC is also present, diagnose and repair that DTC before continuing with this test procedure. Inspect the fusible link in the charge wire or fuses in the PDC depending on application. If an open fussible link or fuse is found, use the wire diagram/schematic as a guide and inspect the wiring and connectors for damage. Turn the ignition off, inspect the alternator belt and tensioner for proper size and operation. Check for proper belt routing installation. Are the belt and tensioner installed properly and functioning correctly? No, perform the appropriate repair. Start the engine, hold the engine speed above 1157 rpm. With the scan tool, navigate to data display and monitor the target charging voltage. Using a voltmeter, measure the voltage at the alternator output stud. Is the alternator output more than 1.0 volt below the target charging voltage? Yes, verify that there is good pin to terminal contact in the alternator connector. If OK, replace the alternator. Turn the ignition off, disconnect the PCM harness connector. Start the engine, hold the engine speed above 1157 rpm. With the scan tool, navigate to data display and monitor the target charging voltage. Using a voltmeter, measure the voltage between ground and the fused B+ circuit at the PCM harness connector. Is the fused B+ circuit voltage more than 1.0 volt below the target charging voltage? Yes, repair the fused B+ circuit for excessive resistance. 0 Response to "P2503 Charging System Output Low"